On this episode of the Rusty George Podcast, Rusty sits down with longtime friend and pastor Mike Breaux, along with Mike’s daughter and son-in-law Jodi and Mike Hickerson. 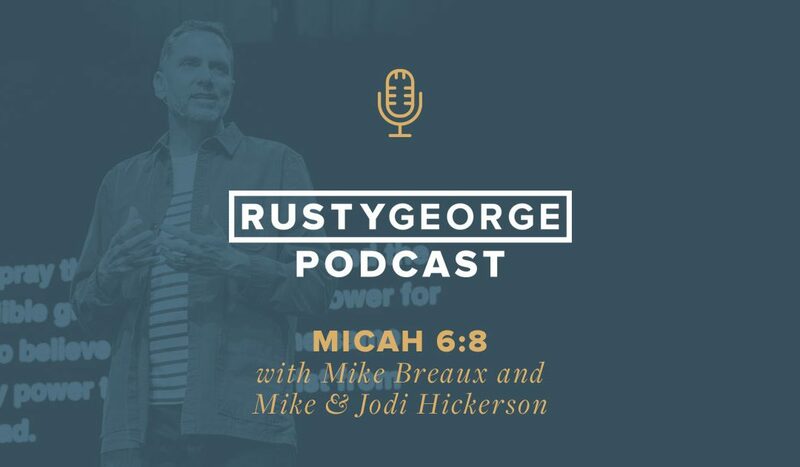 With the release of Rusty’s new book, the gang sits down and talks through Micah 6:8 and what it means to act justly, love mercy and walk humbly with God. What a great topic of discussion and title for your newest book. The four of you have had such a significant impact in my life and I will always be grateful for your teachings. I have witnessed God working in ways I never could have imagined over the last few years. Micah 6:8 is one of my favorite verses and a great reminder on how we need to live our lives, a reflection of the love of God that lives in us. We are so blessed.